Foote in the Door believes in inclusive casting. We encourage auditions from artists who self-identify as members of under-represented communities. We cannot engage equity members. All performers are unpaid. ​We will have evening technical rehearsals from May 27 to May 30 and performances from May 31 to June 8. There is a matinee on June 2. June 3 and 4 are dark. We are looking for strong, trained voices, dancing/movement background and acting ability to bring these characters to life. We strongly suggest that you familiarize yourself with the script and music. Rehearsals start the week of March 3, 2019. Character work will be scheduled individually with actors in major speaking roles during the month of February during the last two weeks in February. (This will consist of a 2 hour one-on-one session with the director and assistant director). 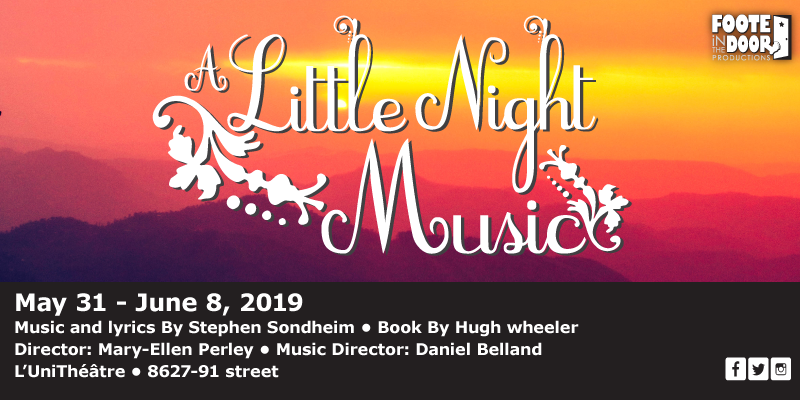 What to expect: You will be asked to sing a prepared song preferably from A Little Night Music (with the exception of Send in the Clowns) or any Sondheim piece and then read a side from the script - both may correspond to the role for which you are auditioning. Being familiar with the script is advantageous. 2) Please have the song memorized and have your song performance ready (i.e. tell the story, don’t just sing the song). 3) We will accept either sheet music to be used by our accompanist or voiceless tracks on mp3/iPhone. 4) Please send a headshot and resume in advance to footeinthedoor@gmail.com. The roles of Count Carl-Magnus Malcolm, Anne Egerman and Madame Armfeldt have been cast prior to this process.